Rosacea is a chronic disorder causing "flare-ups" of inflammation to the skin. 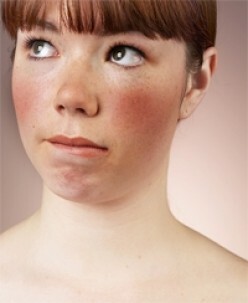 Nearly 16 million people suffer from Rosacea, primarily those of Scandinavian, Irish, or British decent. Commonly described as "blushing" or "a flushed look to the skin", Rosacea's most common physical characteristics are redness on the cheeks, nose, chin and/or forehead, visible blood vessels, and sometimes little bumps. Around 40% of people who have Rosacea also have relatives with it, so it is considered hereditary. Other symptoms include burning, stinging, or swelling to the skin, eye irritation, and skin that is extremely dry. Proven statistics of Rosacea have to do with an inflammatory response to common skin bacteria or harmless skin mites called Demodex (these live on everyone's skin, disgusting I know). Sun exposure, emotional stress, extreme weather (hot/cold), wind, humidity, vigorous exercise, alcohol, and spicy foods are all known triggers of Rosacea flare-ups. Certain skincare products and cosmetics can also cause them. Rosacea prone skin is easily irritated so, like Psoriasis or Eczema, it's best to stick with natural products free of sulfates, parabens, fragrance and dyes. Witch Hazel, alcohol, Peppermint, Eucalyptus, Clove, Salicylic Acid, harsh scrubs, and chemical SPFs may also be trigger causing factors so always be aware of the ingredients in the products you're using. There is no cure for Rosacea, but there are affective treatments available. Medications, both oral and topical, have been proven to reduce inflammation and kill bacteria. Laser treatments that remove visible blood vessels have also become quite popular in recent years. Based on my experience working in the laser industry, I advice you to always get treatment from a physician, not a laser clinic with Estheticians or "laser technicians" doing the work. Many times, these people are poorly trained and fresh out of school. Because of this you have a pretty good chance of either getting burned by the laser or you'll get a really ineffective treatment because the technician keeps the machines at low levels in fear of burning you. The most import thing is to have the proper skin care regimen. You want to use very gentle products made for your skin type. If a product doesn't say it's specifically for Rosacea, words like sensitive, stressed, or calming on the label means it will help. Also, look for ingredients such as Arnica, Colloidal Oatmeal, Chamomile, and Lavender.